You owe it to yourself to play this game. ioWare has built an empire around an unwavering commitment to the creation of compelling and expansive sagas. To this end, the developers have created entire galaxies brimming with potential and the promise of adventure, and populated with characters both deep and believable. My first experience with their work was the original Knights of the Old Republic, an incredible, character-driven epic set in the Star Wars universe. By the time I had completed the game my simple protagonist had evolved from amnesiac refugee to Jedi Master and I was filled with fond memories that, though completely empathetic, still filled me with pride. Five years later, BioWare released Mass Effect to critical acclaim. Time spent honing its craft had yielded a shining jewel in the RPG genre that broke fresh ground in visual style, control, and multi-tiered character development. The foundation set in place by the original game had a few cracks but remained rock solid through many repeated playthroughs, during which I cultivated a character I became quite proud of, and who grew into a very convincing extension of myself. Having mastered every conceivable decision and path available in Mass Effect, I had set in stone my own perfect story and eagerly awaited the chance to continue. That chance arrived with a sequel that in every way exceeded my expectations. In Mass Effect 2, BioWare has created its masterwork, setting the bar higher than I even believed possible. Time to play hero again: assemble a team that is as diverse as the world around you.The central focus of the Mass Effect universe is one Commander Shepard, a highly decorated and respected leader responsible for the defeat of a galaxy-wide invasion effort as described in the original game. The sequel picks up two years later, after the original threat has been neutralized. Shepard, ever vigilant, has been mopping up the scattered remnants of resistance when he is contacted by rogue human-interest-group Cerberus. Cerberus informs him of the systematic disappearance of several human colonies on the fringes of populated space. With little more than a ship and skeleton crew, the commander is tasked with the tracking and ultimate rescue of the colonists lost to the unknown. Throughout the investigation, Shepard meets and recruits a specialized group of talented individuals and explores many of the uncharted and unknown regions of the Milky Way. Danger, intrigue, and even romance can be found as the commander and his crew uncover the secrets of the void. 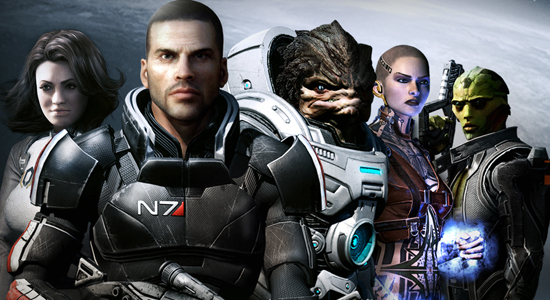 Mass Effect's basic formula is the tried and true standard of most of BioWare's RPG library. The main character is given humble origins but fantastic potential. Gradually, he or she gathers a party that is as diverse as the world they occupy. Over the course of the game, each decision made and action taken impact the dynamics of the group and the moral alignment of the protagonist. Lives are saved or destroyed, loyalties shift and strengthen, and the huge events hinge on the choices of the player. So moving are the results that the player rarely fails to develop an emotional investment in the character they've created. Strange bedfellows: join with the pro-human activists of Cerberus to combat a threat to the entire galaxy.In Mass Effect 2, BioWare has provided an opportunity rarely afforded to players: the chance to reap the benefits of their previous decisions and to witness the full weight of all their successes and mistakes. The chance to import my saved character from the previous game is in my mind the single greatest feature of the game, elevating the experience from simple roleplaying to the creation of a legacy. Such personal investment, however incredible, is not required to appreciate the brilliance that shines from every twist and turn Mass Effect 2 has to offer. First time players are afforded an excellent jumping-off point where they can enter the story with the bare minimum of preamble. So large is the scope of this newly expanded galaxy that sticking solely to the story material will result in nearly 50 hours of play and will take players to less than half of the star systems and planets available for exploration. Visually, the game is stunning. Lighting, textures, and facial animations are all top-notch, and random artifacts such as those that occasionally plagued the original game are nowhere to be found. Each location has been given a specific feel, and the attention to detail is outstanding. Standing in Omega station, quintessential hive of scum and villainy, filled with a bustle and hum of a futuristic marketplace, evoked memories of Rick Deckard navigating the squalid underbelly of San Francisco. Other remarkable locations include several jungle planets, abandoned human colonies, a prison ship, the debris-strewn wreckage of several starships, and a mad scramble through an a hive-like alien ship that would give Ellen Ripley recurring flashbacks. Breathable atmosphere: each location has been given a specific feel, and the attention to detail is outstanding.Gone are the standard cookie-cutter floorplans that made up every interior location of the original game. Players can expect a wide range of terrains and locations to battle through and explore. Though graphically outstanding, the game's performance in the face of the visuals is even more impressive. One of the main complaints I heard about the previous entry was how sluggish it sometimes felt, especially during combat. That slowness has been largely eradicated, with combat itself receiving substantial streamlining. Battles now have a much more fluid feel to them both in Shepard's movement and in the direction of your squadmates. The control scheme has seen some tweaking, as well as the effectiveness of individual powers and abilities. Squadmates now have fewer individual skills but the skills themselves have more specific applications. Choosing the correct team for the job is therefore increasingly emphasized. Enemies can have any combination of three unique defenses as well as three main modes of attack. Creating a good mix of skills tailored to the job is essential to survival, especially on the higher difficulties. Survival is only possible with contributions from every teammate, markedly contrasting the original game where victory was often a result of persistence more than of skill. Think tactically: in Mass Effect 2, survival is only possible with contributions from every teammate.The only adjustment I found to be a negative was the addition of an anti-ammunition system. That's right, anti-ammunition. Instead of locating rounds for individual weapons, players instead collect thermal clips apparently required to absorb the heat of firing the gun. Not only is this a detriment to the newly improved combat pacing, forcing players to search for and collect these clips, but this is possibly the least practical weapon system I've ever seen in any sci-fi universe I've encountered. Why would anyone design a system to trap heat instead of dissipating it? Beyond that, why would these thermal clips not transfer over to every gun I carry? Picking up a single clip allows me to reload everything from my pistol to my sniper rifle, which implies that they are universal. However, the guns don't draw from a single pool of clips which means that my favorite gun runs out while my least favorite is chock-full of clips. Ugh. But throughout the entirety of the game, the ammunition issue was the single speck of negativity I could find — and it's not nearly enough for me to discount all the other ways that combat has been improved. Taken as a whole, the game is a work of art in every respect. I have no reservations at all in recommending it for the full five stars, as well as giving it a strong nomination for Game of the Year. You owe it to yourself to play this game. Really. No game quite moves me like the original KOTOR did, but this title is an improvement over its forebear in every way. Including quests as a part of bonding with NPCs brings teammates' stories to life — and little moments with Joker and Chakwas only bring players closer to their virtual comrades. Even minor features such as hacks/bypasses and mining have been elevated from being tedious to essential. As I've read of others, this is so complete a game that, as with KOTOR, I may be satisfied with a single playthrough. But what a playthrough. I never know how much detail I should discuss or reveal in these things. Hacking and bypassing systems have been made much more entertaining without being made any more difficult. They did away with simple simon and gave you something more stimulating instead. Just another example of how BioWare worked to improve EVERY aspect of the game. One of my most complete gaming experiences. Period. Though titles released early in the year tend to get overlooked for game of the year discussions, this one will probably still be my top contender for that accolade when the end of 2010 begins to loom. I still have high hopes for Bioshock 2, but I don't know if it can DELIVER like this one did.